We value "honesty, innovative and quality" because we know that we are not only supplying equipment Microwave Fungus dry fungicidal insecticide Drying Equipment to our clients but the partners to help our clients to get a better result. Keeping this in our mind, we not only make high quality food processing equipment Microwave Drying Equipment, but also help the clients to figure out the optimum processing work flows, make amendments according to client's specific needs, training staffs for the user of our equipment and even more, because Shandong Leader Machinery Co.,ltd. believe that our users or clients' success is the foundation of ours. The advantages of Microwave Fungus dry fungicidal insecticide Drying Equipment heating speed is fast: conventional heating (such as flame, hot air, electric heating, steam, etc.) all use heat conduction, convection and thermal radiation to transfer heat to the surface of the heated object first, and then gradually increase the center temperature by heat conduction (commonly known as external heating). Microwave Fungus dry fungicidal insecticide Drying Equipment requires a certain heat conduction time to achieve the desired temperature in the center, while the time required for the object with poor thermal conductivity is longer. Microwave heating is internal heating, electromagnetic energy directly to the medium molecule is transformed into heat, and the transmission properties of the material and medium heated simultaneously, without heat conduction, and the lack of internal cooling conditions, the temperature gradient distribution caused by the internal temperature is higher than the external form, internal drive water to steam surface infiltration pressure, acceleration the migration rate of evaporation of water. Especially for the food with water content under 30%, the speed can be shortened hundreds times, and it is even dry in a short time. Microwave Fungus dry fungicidal insecticide Drying Equipment is easy to control: the control of microwave power is regulated by switch and knob, that is to say, it is used, no heat inertia, power continuous adjustable, and easy to automate. 6). 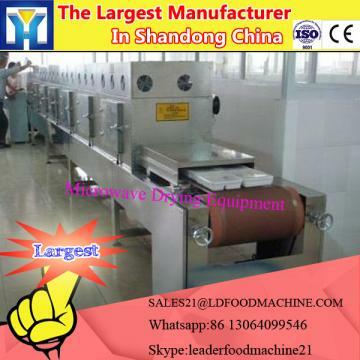 1 year complete warranty for Microwave Fungus dry fungicidal insecticide Drying Equipment .